Verdict Forms (General or Special) and the Two-Issue Rule В сложной финансовой ситуации приходит на помощь кредит наличными в Казахстане. I previously discussed the importance of jury instructions and the jury instruction conference. Now, I want to discuss the importance of the verdict form. This is the form the jury fills out during its deliberation that identifies the associated liability and damages it determines. There are 2 types of verdict forms used. A general verdict form is a relatively simple form that is easy to prepare and asks the jury to determine whether it believes the defendant is liable and, if so, the damages the defendant owes the plaintiff. This is the type of form a plaintiff oftentimes wants. A special interrogatory verdict form, on the other hand, is a verdict form that requires the jury to answer numerous Yes and No questions that forms the basis of how the jury reaches the liability and damages it determines. The special interrogatory verdict form, unlike the general verdict form, has the jury make factual findings by answering numerous questions relating to the theories of liability and the corresponding affirmative defenses. Oftentimes, a defendant prefers a special interrogatory verdict form. If a party objects to a special interrogatory verdict form or certain questions within the verdict form, it is important for them to put that objection on the record. Likewise, if a party objects to a general verdict form, it is important for them to put that objection on the record and submit a special interrogatory verdict form. See Whitman v. Castlewood Intern. Corp., 383 So.2d 618 (Fla. 1980). The trial judge has discretion to determine the type of verdict form that is submitted to the jury. See Walsh v. Diaz, 409 So.2d 1186 (Fla. 4th DCA 1982). Thus, the standard of appellate review is abuse of discretion and absent prejudicial or reversible error, the verdict form given to the jurors will not overturn the verdict. See Triana v. Fl-Shock, Inc., 763 So.2d 454 (Fla. 3d DCA 2000). Notably, in a complex civil case with multiple defendants and multiple theories of liabilities against the defendants, the Fifth District Court of Appeal held it was reversible error to submit a general verdict form to the jury when the defendants objected to the use of that form. See Derrick v. Clemons, 576 So.2d 939 (Fla. 5th DCA 1991). There is also an important appellate doctrine known as the two-issue rule when it comes to verdict forms that finds, “where there is no proper objection to the use of a general verdict, reversal is improper where no error is found as to one of two issues submitted to the jury [one of which could be determinative of the case] on the basis that the appellant is unable to establish that he has been prejudiced.” See Whitman, 383 So.2d at 619. The reason this rule applies is because if more than one issue is submitted to the jury and either issue could be determinative of the case, the general verdict form makes it impossible for an appellate court to determine which issue formed the basis of the jury’s verdict. See Food Lion, L.L.C. v. Henderson, 895 So.2d 1207 (Fla. 5th DCA 2005). For example, let’s say an injured plaintiff sued a defendant under two theories of liability: (1) negligent failure to maintain premises in a reasonably safe manner and (2) negligent failure to warn the plaintiff of a dangerous condition. The jury returned a general verdict form in favor of the plaintiff. The defendant did not object to the use of a general verdict form that simply asked, “was there negligence on the part of the defendant that was the legal cause of injuries to the plaintiff.” The general verdict form, unlike a special interrogatory verdict form, did not go into detail as to which theory of liability the negligence (that the jury determined) was grounded on. 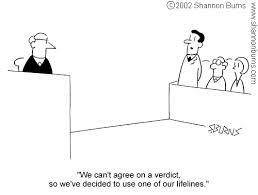 The defendant appealed as to one theory of liability, but under the two-issue rule, the appellate court had to affirm because it was uncertain which theory of liability the jury based its verdict on and there was no error raised on appeal with the other theory of liability. See Food Lion, 895 So.2d 1207. In another example, let’s say a plaintiff sued a defendant for breach of contract. The case proceeded to trial and a general verdict form was agreed on by the parties and used. The jury returned a verdict in favor of the defendant. The plaintiff appealed and argued that the trial court erred in instructing the jury on one of the defendant’s affirmative defenses. But, because of the general verdict form, it was uncertain whether the jury ruled in favor of the defendant on this defense or other affirmative defenses raised by the defendant for the jury’s consideration (that would be determinative of the case). Thus, under the two-issue rule, there could be no reversal where “no error is found as to one of the issues that can independently support the jury’s verdict.” See Barth v. Khubani, 748 So.2d 260 (Fla. 1999).